A few weeks back I had the pleasure of reading Class Three; Duncan P.Bradshaw's first zombie novel, and in fact his first novel ever. 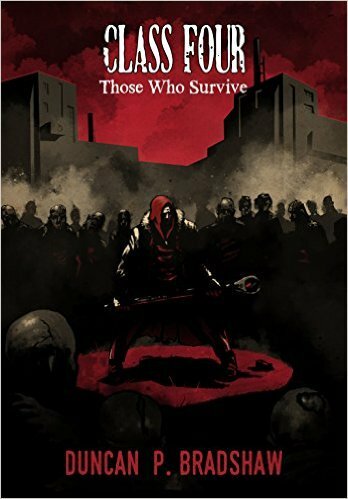 Now I have finished reading the sequel to that one; Class Four: Those Who Survive which is the first in a follow up trilogy. The world in which the book takes place in is one where overnight (and I guess some places overday) the planet was plunged into complete zombie armageddon thanks to a returning space probe. Both Class Three and Class Four are set in the U.K, mainly England. This time around rather than follow the two brothers Jim and Philip we instead follow Francis; a man they briefly met and who in the many months since zombie apocalypse occurred has been looking after a young boy called Nathan. A chance meeting with one of the brothers gives Francis hope for he is told of a commune in Wales where survivors have banded together, so he decides that is where he shall go. Meanwhile in a different storyline we follow the fates of a group of people led by a stern man called the Gaffer who have holed up in a biscuit factory. Class Three was an off kilter blend of comedy and horror, often seeming out of place of each other but never in a bad way. In Class Four the comedy has been dialled back a bit it seems, this is a far more serious book, sure it has plenty of funny moments but only for certain characters and certain times. The descriptions are as witty as ever as is the general tone of familiarity with which Bradshaw writes. Until around 40 pages in I thought that this sequel was straight horror, it was only at that point that I saw the humour start to drip in. This change in direction is not a negative or positive thing, I would have been happy to have more of the humour of Class Three but at the same time this is another darn good read and I soon settled in to the more bleak outlook that the more serious Francis has of the ruined world. Of Francis himself he is not as immediately memorable as the loon that was Phil (who appears here briefly in a fun cameo), his tragic back story is drip fed to the reader in the form of nightmares he has, Clever framing devices were used in Class Three that again are used here, albeit in different ways. The first book had seemingly unrelated stories that it later became apparent were very related. This time around there is around half the book that takes place in the past. The whole biscuit factory plot is early on revealed to be taking place in the past as Francis comes across the location but it is devastated. This made these sections all the more addictive as I really wanted to know how this place came to be destroyed. This isn't even the only separate story going on in Class Four, in the past section there is a therapy group where each of the members are asked to relate their experiences of the outbreak. There are four of these scattered throughout the book, they even get their own title pages, each one narrated in first person. We get a mentally disabled boy describe his time in a bunker with his family and dog, an abused wife, an out of work man, and my favourite; a police woman who talks about the night the world fell apart whilst she was on the job in Manchester. These sections really help keep things interesting, reminded me a bit of David Moody's Autumn: The Human Condition compilation of short stories. The main story of Francis and Nathan is a pretty simple one with similarities to the first novel in terms of them trying to get to Wales, and their misadventures in doing so at the hand of cannibals, crazies and the walking dead. It does have the low point of the book which thankfully only lasted around 20 pages. There is a part where they end up at a freak show and encounter a number of different zombie mutants such as a shark boy and conjoined twins. My problem with this part was that it dragged on a bit, each mutant gets it's own chapter, each new encounter plays out roughly the same way, they had great looking title cards to the chapters but I felt due to the similarities these could have been halved as I found myself thumbing ahead to see how much more of these freak fights there were left. Thankfully this is the only dip in an otherwise fantastic book. The biscuit factory story was certainly the more interesting of the two, only due to the number of different characters and the knowledge that things would go to hell. Having this variation, and the really clever way he subtly reveals big plot details really helped keep things feeling fresh (as fresh as anything can feel in a rotting world at least). The zombies, the victims of the zombies, as well as victims of the bad guys again have lots of gruesome details to really make the violence seem especially grim. Eyeballs are again destroyed, limbs cut off, torture and vile descriptions make what is happening all the more violent, I can't recall a zombie author who spends so much time describing in detail the results of damage caused to people and the undead as Bradshaw does, is off putting in the best way, I also love that his zombies regurgitate anything they eat, not only makes sense but makes things all the more disgusting! Going back to what I said in my review of Class Three it was again fun to see the antagonists (again crazy cultists) not really ever meet up with the hero characters of the book, their chapters mostly stand apart. Also this book is again full of references to pop culture, there were several Star Wars quotes dotted throughout and a great tip of the hat to the iconic 'tears in the rain' monologue from Blade Runner. Class Four: Those Who Survive is another great book from Bradshaw, aside from the freak show section being slightly overlong for me personally the only reason I see this as a lesser book to the first is that the surprise was not there, I went in to this expecting a great book, and indeed that is what I found, where before I didn't know what to expect and so was bowled over. With this one ending on a cliffhanger I can't wait to read more of Bradshaw's addictive and funny view of zombie armageddon.